Raised in Wisconsin, Willem Dafoe is the second youngest of eight children who all look and sound alike. But the similarities end there: Willem was the only Dafoe to follow an artistic bent, while the rest of the brood took the well-trod professional route, becoming lawyers, nurses, and doctors. At 17, Dafoe enrolled at the University of Wisconsin. The drama department failed to hold his interest, so he joined Milwaukee's avant-garde Theater X troupe. Two years of touring with the company showed him the greater part of the U.S. and Europe. Dafoe's next stopover was Manhattan, where in 1977 he landed a promising role in a production with the Performance Group. There, he met artistic director Elizabeth LeCompte, with whom today Dafoe shares a house and a son named Jack. Dafoe and LeCompte eventually founded the celebrated Wooster Group, known for its unique multimedia-deconstructionist style of theater. After dozens of shows, Dafoe made his film debut as a featured extra in Michael Cimino's ill-conceived Heaven's Gate . In 1985, he landed his first sizable role in To Live and Die in L.A. A year later, he earned a breakthrough (and Oscar-nominated) role as the messiah-like Sergeant Elias in Oliver Stone's Platoon . Non-mainstream performances in mainstream films followed: Alan Parker cast Dafoe as a straight-laced F.B.I. agent in 1988's Mississippi Burning and the following year, Stone called upon him again to play a bitter disabled veteran in Born on the Fourth of July . That same year, Dafoe found himself in the headlines due to his title-role assignment in one of the most controversial films of all time: Martin Scorsese's The Last Temptation of Christ . In recent years, Dafoe has had the luxury of being discriminating in his choice of roles: "I don't get paid seven million for the movies I do, and when I'm top banana, they're not big studio movies. . . . I can switch hit, I can go and make a small movie, I can make a big movie." He definitely has divided his efforts between big and small projects: In the early '90s, he played the loathsome Bobby Peru in David Lynch's Wild at Heart , a redemptive drug dealer in Light Sleeper, T.S. Eliot in Tom & Viv, and a lawyer who finds himself crotch-deep in some very nasty Madonna-related business in Body of Evidence. In the late '90s, Dafoe popped up in the 1996 epic The English Patient ; continued his mean streak in Speed 2: Cruise Control ; co-starred alongside Nick Nolte and Sissy Spacek in Affliction ; and visited the virtual-reality realm in the David Cronenberg sci-fier eXistenZ . He has twice been nominated for Supporting Actor Academy Awards: in 2001 for his role in Shadow Of The Vampire and in 1987 for Platoon . In 2010, he won a Bodil award for Best Actor in Antichrist (2009). Dafoe has continued to enjoy a successful acting career with roles in films like A Woman (2010), John Carter (2012)and The Hunter (2012). More recently, he starred in the films Nymphomaniac: Volumes I and II (2014), The Fault in Our Stars (2014) and John Wick (2014). His latest credits include voice work in the smash hit Finding Dory (2016) and The Great Wall (2017) with Matt Damon, as well as 2017's Opus Zero and Murder on the Orient Express . For his work in the critically acclaimed indie film The Florida Project (2017), Willem received his third Supporting Actor Academy Award nomination and his second Golden Globe nomination. In 2018, he played the role of Vulko in the box office hit movie Aquaman (2018). He also starred in the 2018 film At Eternity's Gate , earning a Golden Globe and Academy Award nomination for his work in the film. 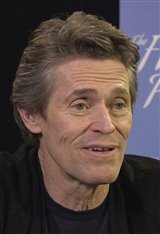 Willem, whose birth name was William Dafoe Jr., is a vegetarian. He was known as Billy in Junior high but was nicknamed Willem in high school, and the name stuck. Finding Dory official premiere teaser trailer is here!